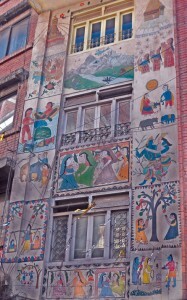 No first time visitor to Kathmandu can avoid being struck by the power and impact of the capital’s street art, in a way that cannot be matched in for example Western cities such as London. The street artists of Kathmandu may rightly be said to be hero social and social justice activists that tap in to the passions and concerns of countless numbers of the broader population, and doing so in a way that is completely accessible to all. Styles range from the naive/simple to elaborate and technically outstanding: the images of the murals on the wall of the capital’s mental health hospital for example are searing in the depiction of mental illness, and call for the humanity of all passers by who see them — educating the latter, and in so doing performing almost a spiritually enlightening service to those who view them. The Siddhartha Art Foundation is involved in a major initiative to visually record the street art of Kathmandu, which will be of major benefit as an educational resource once complete. 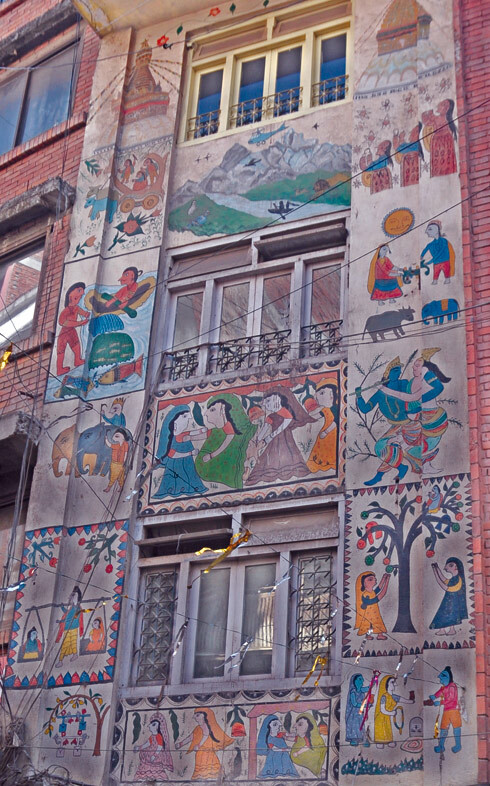 ‘… Not too far from Mithila Yain Gallery is the famous eatery Fire & Ice, at the entrance of Thamel, which has parts of its walls painted with Mithila motifs. However, Bhumi Restro Lounge in Lazimpat has its walls specially designed by six JWDC women with mud brought all the way from Janakpur. “We had to provide some cow dung,” laughs Rinesh Amatya, one of the owners of Bhumi, sharing that several customers inquired about the mud relief and paintings when the restaurant opened some three years back. A pair of elephants, a witch, and once again, plenty of fish flank the walls that face the outdoor patio. Taking some 22 days, artists Sudhira Karna, Sita Karna and Urmila Yadav climbed up on bamboo scaffolding to paint the walls of Mahaguthi Handicrafts in Kupondole, Patan. Made over two years back, the paintings depict the narrative of Sita and Ram’s wedding in Janakpur, along with a huge Ganesh. … read more. Artudio website’s Street Art section.